FROM PERTH AMBOY TO TOTTENVILLE: Since 1868, bills to secure a bridge, or a series of bridges between Staten Island and New Jersey had been introduced in the New York and New Jersey state legislatures. While freight rail service was provided with the 1890 construction of the Arthur Kill railroad bridge, the three passenger ferries between Staten Island and New Jersey were being taxed beyond their capacities. New solutions were sought to deal with the surging demand in automobile and truck travel after World War I. In 1923, the New York and New Jersey Bridge and Tunnel Commission issued a report calling for the reconstruction of a highway bridge between Staten Island and Perth Amboy. The report also called for the construction of a combination highway and railroad bridge between Staten Island and Elizabeth. The bridge is not only desirable, but also practicable. The lack of a fixed crossing between these points has in the past been the cause of great economic waste and has created intolerable traffic conditions that are steadily growing worse. Since the channel was shallow, and a low-level bridge was thought to be the solution, the cost was expected to be low. However, the New Jersey State Board of Commerce attacked the idea of building a low-level bridge, and instead advocated constructing a bridge with a 135-foot clearance to insure the viability of New Jersey ports. The two state legislatures acceded to this demand, and assigned construction of the bridge to a new bi-state agency: the Port of New York Authority. The bridge proposal was to be part of an integral port improvement. During the spring of 1924, the state legislatures of New York and New Jersey authorized construction of the Outerbridge Crossing and the Goethals Bridge, and allocated $3 million for preliminary design and engineering studies. Despite contentions from shipping interests that the bridge would block water traffic on Arthur Kill, the War Department approved the plans during the spring of 1925. Soon thereafter, the Port Authority sold $14 million worth of bonds for the two bridges. DESIGN AND CONSTRUCTION: The Port Authority tapped John Alexander Waddell, an American engineer with experience designing structures around the world, to design the Outerbridge Crossing and its twin to the north, the Goethals Bridge. The Outerbridge Crossing is a longer version of the steel-truss cantilever Goethals Bridge, with a 750-foot-long suspended center span and two 375-foot-long side spans. However, there is a subtle difference: unlike the Goethals Bridge, the Outerbridge Crossing features through truss spans (each measuring 300 feet in length) at the end of each side span. The piers were sunk 50 feet below the bottom of the channel. Long viaducts, comprised of steel girders set atop 79 arched concrete piers, carry the roadway to its mid-span height of 135 feet above Arthur Kill. From end to end, the bridge measures 10,800 feet in length. In addition to carrying four vehicular lanes, the bridge was designed with a walkway for pedestrian and bicycle traffic. 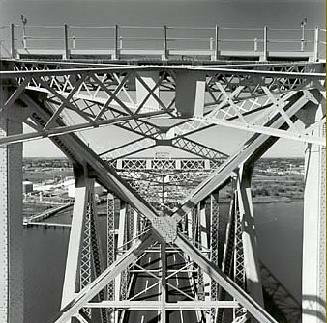 The Outerbridge Crossing opened to traffic on June 29, 1928, the same day that the Goethals Bridge to the north opened. The new bridge was named after Eugenius Outerbridge, the first chairman of the Port Authority and a Staten Island resident. Outerbridge, one of the drafters of the compact that created the Port Authority, urged the construction of the bridges between Staten Island and New Jersey, since he believed that so long as Staten Island was isolated it was a hindrance rather than an aid to port facilities. IT TOOK THE VERRAZANO TO MAKE IT PROFITABLE: When the initial studies were made in the 1920's, the Port Authority estimated that it would take ten years for the Outerbridge Crossing and the Goethals Bridge to become self-sufficient. Although the Outerbridge Crossing handled 500,000 vehicles during 1929, the first full year of operation, usage dropped sharply because of the Great Depression and World War II. It was not until 1947 that the bridge handled more than one million vehicles. Still, the bridge did not become self-sufficient until the Verrazano-Narrows Bridge opened in 1964. Since 1952, the Outerbridge Crossing has carried the Route 440 designation between New Jersey and New York. According to the New York State Department of Transportation (NYSDOT), approximately 80,000 vehicles use the Outerbridge Crossing each day. OUTERBRIDGE RECONSTRUCTION: In 1996, the Port Authority began work to repaint the one million square feet of structural steel on the truss structure of the Goethals Bridge. Workers removed old coats of lead-based paint, and applied a three-coat system that included a zinc primer, epoxy intermediate coat and a urethane topcoat. The $19 million project was completed in 1998. In 2003, workers completed a three-year, $71 million project to rehabilitate the Outerbridge Crossing. Work crews repaired portions of the bridge's deck, replaced some of its steel and applied a fresh coat of asphalt pavement. In 2009, work is expected to begin on a $311 million replacement of the deck on the Outerbridge Crossing. This project, which will involve replacing the lower layers of steel and concrete that support the road above, is scheduled for completion in 2015. A FASTER WAY THROUGH THE OUTERBRIDGE TOLLS: In June 2005, the Port Authority opened two high-speed EZ-Pass toll lanes at the Staten Island toll plaza. The two toll lanes, which were built to the left of the existing toll barrier, replaced three 25 MPH toll lanes utilizing the existing barrier as part of a two-year experiment. The Outerbridge Crossing, NJ 440 (Middlesex Freeway Extension) and NY 440 (West Shore Expressway) become part of the new Interstate 395. Currently, the I-395 designation, which will be used to identify a spur route from Interstate 95 (New Jersey Turnpike) to Staten Island, is not used in either New York or New Jersey. SOURCES: The Bridges of New York by Sharon Reier, Quadrant Press (1977); Engineers of Dreams by Henry Petroski, Vintage Books-Random House (1995); "A Guide to Civil Engineering Projects in and Around New York City," American Society of Civil Engineers (1997); Perpetual Motion: The Illustrated History of the Port Authority of New York and New Jersey by Joe Mysak and Judith Schiffer, General Publishing Group (1997); "At Outerbridge, NJ Has Its Crossing To Bear" by Al Frank, The Star-Ledger (3/28/2000); "Happy Birthday: EZ-Pass Turns Ten" by Sy Oshinsky and Chris King, AAA-Car and Travel Magazine (December 2003); "EZ-Pass Made Easier Through the Outerbridge Crossing," WABC-TV (6/28/2005); New Jersey Department of Transportation; Port Authority of New York and New Jersey; Phil Case; Dave Frieder; Ralph Herman. Outerbridge Crossing, NY 440, NJ 440 and I-395 shields by Ralph Herman.